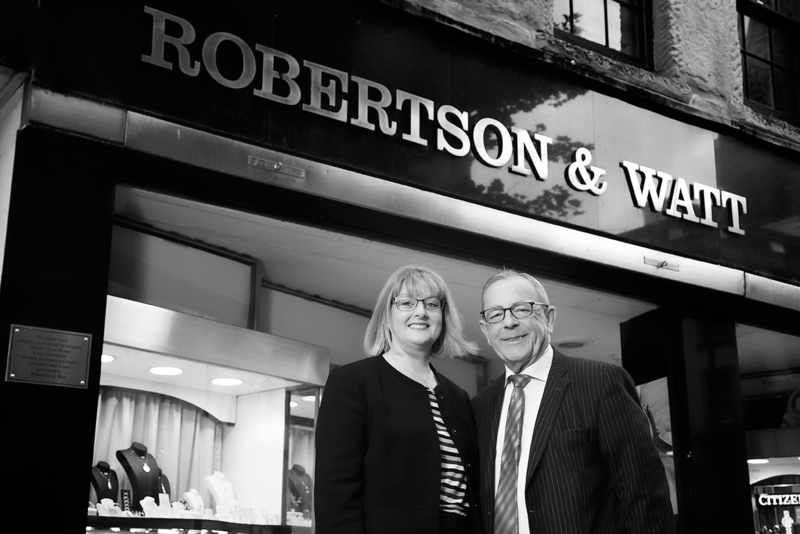 Robertson & Watt was established in 1841 by two Dundee businessmen at 73 High Street. At this time they had showrooms on the ground and basement floors with their office and workshop on the first floor. The shop remained open throughout two world wars even though precious metals were scarce at these times. Following the end of the second world war the last remaining family member of the original partners retired and sold the business to Maurice Porter. Having returned from service during the war he decided not to continue in the family business in Glasgow and moved to Dundee. He was the first of 3 generations to own and work in Robertson & Watt to the present day. In 1960 Robertson & Watt bought the shop next door at 72 High Street. There was a completely new “modern” shop front put in and with the first shop refit a very upmarket arcade for people to browse the jewellery in the windows.It was during the 1960s when the second generation of Porters joined the family business. Hamish Porter served his time at a jewellers in Aberdeen, also studying horology at college before returning to Dundee. At this time he worked alongside some very glamorous staff, as seen in this picture. Incidentally, this lady, Sheila Reilly worked with all three generations of Porters and clocked up 43 years’ service with Robertson & Watt. staircase was moved from the middle to the corner. This was when the third generation of Porter started a Saturday job at Robertson & Watt. Ingrid Meade (née Porter) progressed from Saturday girl to full time in 1989.
has always stood on the shop floor. Ingrid and Graham Meade bought the business from Ingrid’s father and is still run by them today.